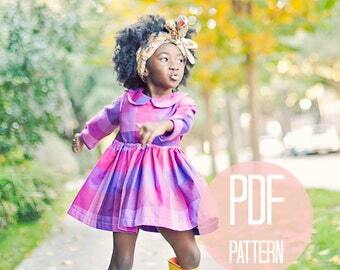 Girls' Peter Pan Collar Dress with Long Sleeves PDF Pattern for the intermediate or brave beginner seamstress! Long, cuffed sleeves and twirl skirt. An easy and quick sewing project. Fun in all style and size of prints from bold florals to bitty dots! FOR PERSONAL USE ONLY. You may not resell FINISHED PIECES or PATTERN. 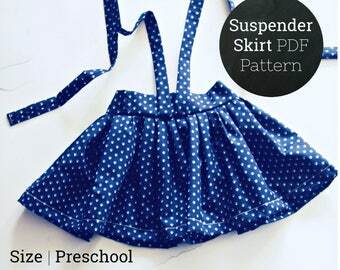 This pattern is designed exclusively for mamas to share in the sewing fun. All patterns, techniques and instructions remain the intellectual property of Fleur and Dot LLC. 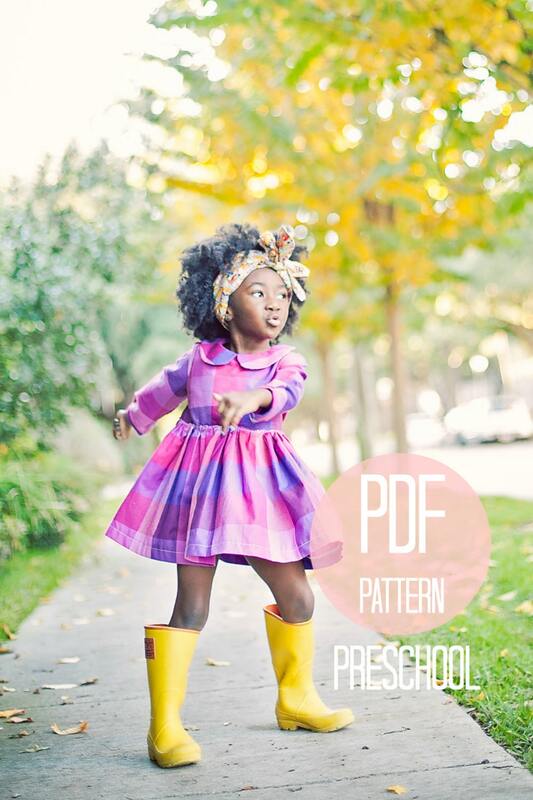 SIZE: This pattern listing is for the Preschool Girl sizes (4T, 5 and 6). 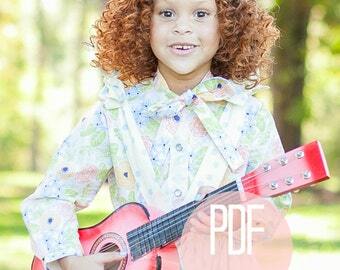 This pattern is also available in Toddler (18-24 months, 2T and 3T) and Youth (7 and 8). 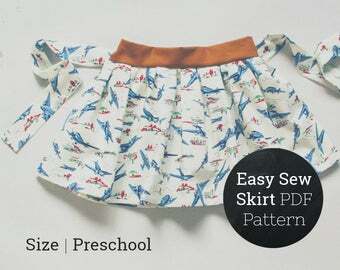 Pattern includes instructions for use on a serger (recommended) or standard sewing machine. 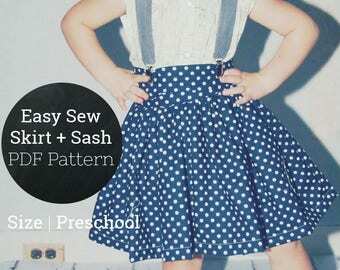 Black and white photos and fun, easy to follow instructions and hand-drafted patterns. Plus, our contact info in case you need just a little help! Love the dress, but can't sew? Our Peter Pan Collar Dress is also available made to order in our shop! This listing is for a digital PDF pattern that will be available for download immediately after purchase. You are not purchasing a ready made dress. Due to the nature of digital products, we do not accept returns or exchanges on digital patterns. Photography courtesy Christin Shoots People for Mocha Kid Magazine. Love this pattern! Great step by step instructions. This was my first dress ever sewn and it came out pretty perfect! Can I resell the pieces I make? No. Our patterns are clearly labeled as for personal use only. Are your patterns true to size? Yes, we strive to align our sizing with common measurements. However, we do have certain design features, such as wider waists on dresses, which are part of the design (and have the added bonus of allowing your little to wear their handmade duds that much longer). We are unable to offer returns or exchanges once you have downloaded your pattern due to the nature of downloadable goods. Thank you for understanding. What if my printer is cutting off some of the pattern? Please print your patterns at 100%. If your printer cuts off a portion of the pattern, we have found it is quite obvious how to redraw the line (or simply cut according). If you still have concerns, please contact Brianne at fleuranddot@gmail.com. Let us know! We're here to help. Contact Brianne at fleuranddot@gmail.com. Why are your patterns hand drawn? Because we love everything handmade! These patterns were crafted by hand and it felt right to release them in a hand drawn fashion. What does "the brave beginner" mean? A brave beginner is anyone with enough gumption and curiosity to jump into a new project before they feel ready—or think they have the skill. We encourage even the newest seamstresses to give our patterns ago (although maybe start your first piece with a lower quality or on sale cotton). Where do I find my files for download after I purchase?